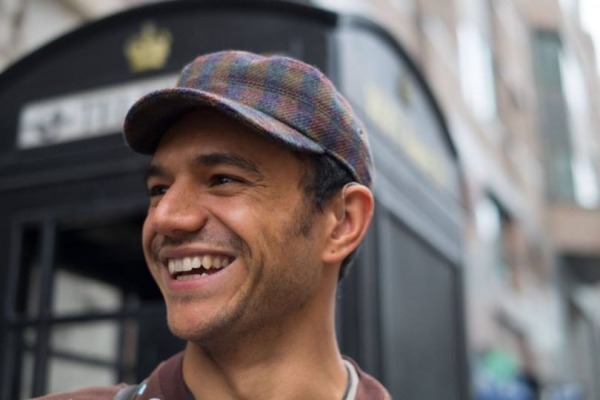 Our new programmer Andrew Parkes caught up with poet Raymond Antrobus ahead his appearance at this year’s Poetry in Aldeburgh in one of a series of events curated by the Poetry School. Hi Ray, before we get into anything, I’d first like to extend hearty congratulations from all of us here for being awarded a Jerwood Compton Poetry Fellowship! These new Jerwood Fellowships are awards given to poets in order to ‘buy them time’ where they can produce and develop their work. Have you had a chance to think about what you’re going to spend this time on at all? Any new projects or ideas you’re looking to develop? Thank you. Yeah, I’m staying busy. As well as developing British Sign Language to incorporate into poetry, I’m working on three very different manuscripts. I don’t want to give it away yet but I’m enjoying the journey they are taking me on. It’s always been a passion of mine to develop wider audience engagement with poetry. Just this week Lisa Kelly and me finished editing the Deaf issue of Magma, which is being launched at the London Review of Books with BSL interpreters and reserved seating for D/deaf audience members on November 17th. I’m looking forward to bringing people to poetry that struggled to access it before. Alongside your writing, a big part of your creative output seems to focus on education – ranging from teaching creative writing courses and workshops, to completing an MA in Spoken Word Education. Why is education such an important part of your practice? I’ve worked with students who didn’t go on to be poets themselves but told me years down the line that the skills they developed writing and performing poetry helped them with public speaking and crafting presentations that won them scholarships, jobs and other career defining opportunities, so I don’t underestimate the potential of poets working in education. Toni Morrison says something about it not being enough to have successful individuals leading the way for progress, what we need now are successful collectives. Being part of collectives / movements / organisations like Spoken Word Educators, Keats House Poets Forum, Chill Pill, The Complete Works etc over the years has only helped me learn more from others and share what I’ve learned. Kind of like locally sourced economic culture capital. People in education know there is no template to being a good teacher and there are always new challenges, including ones we have to walk away from, but if we’re sharing our experiences we’re only strengthening our practise as well as others. We’re delighted that you’ve also recently been appointed to the Poetry School’s board (congratulations once again!). Is there anything you’re hoping to bring to the School with this appointment? Yeah, I hope my presence and input on the board of the Poetry School helps attract people who might have felt the courses weren’t catered for them and undoes some of the negative experiences people may have had with poetry in conventional schools. Much of my energy in education has been about demystifying poetry, where it comes from, who makes it and for whom. I’ve always been about nurturing creative communities so I’m looking forward to building on the excellent work the Poetry School has already done. Back to that ‘D/deaf Issue’ of Magma magazine you’ve been editing: how did you find the process, and do you feel you were able to achieve what you wanted with the issue, presuming you had any goals before you started? I gave it some thought before taking on this role. I spoke to deaf friends, hearing friends and other poets alike. Everyone had a different response. I agreed to it because it put me in a position to give a mainstream platform to poetry that stands out, first and foremost for its quality. I wanted hearing writers to be able to submit to this issue too, to avoid a kind of self-marginalisation. I also wanted to continue the presence that publications such as Beauty is a Verb: The New Poetry of Disability (Cinco Puntos Press) and recently, Stairs And Whispers: D/deaf and Disabled Poets Write Back (Nine Arches Press) as well as the excellent online journal Deaf Poets Society have created. With the Deaf issue of Magma, I hope to cement Deaf poetics in a way where one-off special editions would make any literary magazine seem ridiculously out of touch, rather than cool and quirky. Like I said already, we’re both feeling proud and excited to present it to the world. Selecting the poems to include wasn’t easy but I’m glad I went on this journey. With releases like Magma’s Deaf Issue and the recent anthologies you mention, it would seem that ideas around disability inclusion are, finally, on the rise in popular poetry; although there is, of course, still some way to go. How important is this kind of inclusive thinking to your work as a poet, teacher and events programmer? It’s important to me. I just finished an interview on the Lunar Poetry Podcast which I’d recommend checking out with three other contributors and editors of Stairs & Whispers (Sandra Alland, Khairani Barokka and Giles Turnbull). I realised not even I had spoken directly and publically with other disabled writers about publishing and access before. I found this really constructive. Live events and performance also seems an integral part of what you do – such as your appearances in slams, programming events like Chill Pill, and your MA in Spoken Word Education. How important is poetry’s ‘live’ element to your work and would you say that the poem’s performance is something you consider during the writing process? If sitting at a desk speaking poems out loud counts as a “live” performance I guess it’s a big part of my writing process. My poems perform on the page too but often in a different way. How I lift my poems from the page doesn’t always correlate with how I break lines. Poets taking “breaths” so we can hear where the line breaks can be a jarring listening experience. Not even Shakespeare is performed that way. As a deaf person I really value clear presentation. For me, the body of a poem on the page and how it takes up space in a room are different aesthetics because they require different tools even if they’re trying to communicate the same thing… does that make sense? For some time there has been a perceived distance between ‘performance’ and ‘page’ poets, but it seems to me that there are now great numbers of writers moving easily between these types and breaking down the supposed barriers. Is this something you think about in terms of your own practice at all? A lot of that page and stage discussion is really about race, class and education because for a while it made no sense to me why (in a place like London) there would be so many different kinds of poetry circuits where audiences were divided racially. More people of colour seemed to be at events where people performed their poems and more white people seemed to be at events where everyone read. Both of those spaces suffered from self-marginalisation. However the poetry scene has matured over the years and become a lot more open. I’m proud of that. For myself it’s not something I think about any more. You obviously have lots of experience programming live literature events, what with running the Chill Pill events series; how did you find programming your event for this year’s Poetry in Aldeburgh, and did you set out to achieve anything specific with your line-up here? Not really, they’re pretty obvious choices. Rachel Long won the Poetry School Paterson competition last year with her poem ‘Apples’ and Keith Jarrett, as well as also being an award-winning poet, published his collection Selah earlier this year with Burning Eye Books. I have read and taught in classrooms alongside Keith and Rachel, students and poetry audiences have loved them alike. I’m really looking forward to Aldeburgh! Raymond Antrobus reads alongside Rachel Long & Keith Jarrett at Poetry in Aldeburgh on Saturday 4 November. View the entire weekend programme on the Poetry in Aldeburgh website. Find out more about Ray on raymondantrobus.com. Cover Photo credit: Anthony Keiler. Reproduced with colour filter.